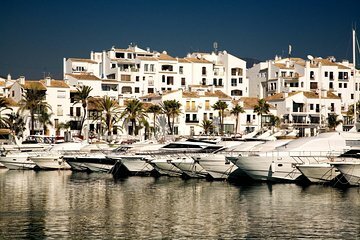 Immerse yourself in the lavish luxury of Marbella and Puerto Banús on a private 4-hour tour from Marbella. Alongside your guide, you’ll visit historical highlights — like Plaza de los Naranjos and Chapel of St John of God — and see the modern side of the city at Marbella’s Golden Mile. Marvel at the grandeur of Puerto Banús Marina, replete with expensive yachts, and relax on the soft sands of inviting beaches. Customize the itinerary according to your interests and receive undivided attention from your guide on this private tour.